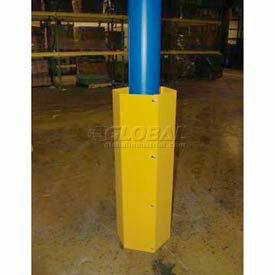 Hexagonal Steel Column Guards Protect Columns And Posts From Heavy Impacts In All Directions. Hexagonal Steel Column Guards have heavy duty 1/4" thick steel plates that withstand heavy collisions from forklifts and other machinery. Built to last while providing easy installation. High visibility yellow powder coat finish. Available in 48" and 60" height. Includes installation hardware. Concrete Lag Bolts are sold separately.